In her installations, painting and filmic work, AK Dolven both covertly and openly utilises the expressiveness of noise, voice, music and the iconic sound of bells in public spaces. How do the visual and the acoustic connect in her art? How does the visual structure of the ocean generate acoustic illusions in a silent video? How does sound relate to passing time and how do both influence the reception of optical perception? Questions that point back to Sergej Eisenstein’s experiments with the acoustic experience of images and the optical experience of sound in the medium of talking movies. A K Dolven, artist. 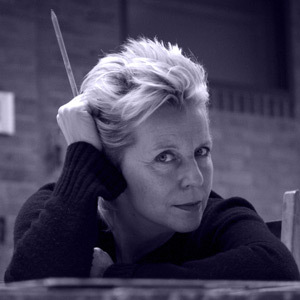 Her paintings, films, video and sound works are shown internationally in exhibitions, collections and museums. Various site-specific sound installations. Most recently: “Out of Tune“ (Folkestone Triennale 2011) and “Ja, as long as I can“, (CCC Tours 2013; Edition Block 2013). Upcoming: major (acoustic) public art projects in Bodø (NO) and in Cambridge. From 2007 to 2013 Professor at the National Academy of the Arts in Oslo. Lives and works in London and on the Lofoten Islands.